Observations at packing plants indicate that some lines of hybrid pigs have a very nervous temperament and others are calm. Some pigs are easy to drive up chutes and others are nervous and constantly balk and back up. Certain lines of lean pigs, which contain the stress gene, tend to be more nervous and excitable than lean lines without the stress gene. Observations at large packing plants have also indicated that lines with some Duroc genetics tend to be calmer. Lines with Hampshire or Pictrain genetics tend to be more nervous. Shea-Moore (1998) found that a certain genetic line of high lean pigs were more fearful than fatter types. She also found that they balked more during driving. Some genetic lines of high lean pigs fight more than fatter pigs (Busse and Shea-Moore 1999). Some producers have moved away from lines which are extremely nervous and carry the stress gene. This also has the added benefit of improving pork quality. 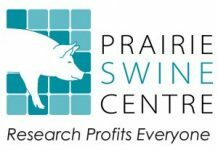 Pork from heavy weight pigs with the stress gene was judged by a taste panel to be tougher and drier then normal pork (Monin et all 1999). There are certain genetic lines of pigs that have extreme bulging hams. Some of these pigs have difficulty walking and they are prone to back breakage during electric stunning because the muscles grow so rapid¡y that the skeleton is immature and small. The author has observed a much higher incidence of broken legs in these pigs that occur during handling and loading. They also have double to triple the problems with damaged meat, blood splash and broken bones induced by electric stunning. In one plant, ultraheavy muscled pigs accounted for 90% of the broken backs and severely damaged loins. Problems with weak bones are further worsened if a producer fails to properly supplement the finishing diet. 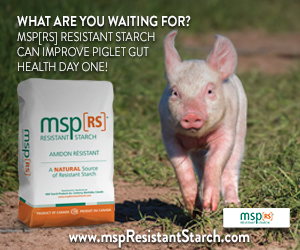 Providing adequate minerals enables a pig to build stronger bones. Finishing pigs at very high weights such as 300 to 350 pounds will also increase death losses, broken bones and PSE. Lines with Hampshire or Pictrain genetics tend to be more nervous. The author has also observed that pork from ultra lean pigs with bulging muscles is often tough. Practical experience has shown that lean pigs with excitable genetics will be easier to load into trucks and handle at the packing plant if the producers have walked through the pens every day during finishing. This is especially important in a wean to finish operation where the piglets remain in the same building from weaning to finishing. Only 10 to 15 seconds per pen per day is required. In facilities with large pens provide 10 to 15 seconds per 50 pigs, everyday. The principle is to train the pigs to calmly get up and flow around the person. If the person stands still as he/she trains the pigs to chew on boots instead of moving. It is important to keep moving in the pens. The person should move at the same speed as a pigs normal walking speed. The person walking the pens should also walk through the pens in a different random direction each day. The handler’s goal is to teach the pigs to drive. One large pork operation with a high percentage of pigs carrying the stress gene found that walking the pens greatly reduced death losses during transport and in the plant yards. Research studies on the effects of environmental enrichment have had varying results (Grandin 1987, 1989, Pedersen et al 1993). In some trials contact with people made pigs easier to handle and in others it made them harder to drive. One of the causes of negative results was spending too much time in the pens. This caused the pigs to become too tame and refuse to drive. They wanted to follow people instead of driving. Other studies showed that allowing pigs to walk in the aisle every day made them easier to load onto a truck (Abbot et al 1997, Geverink et al 1998). In studies where handling in the pens made pigs harder to drive, much more time was spent interacting with the pigs than the 10 to 15 seconds per day which the author recommends. There is an optimal level of exposure for people. An animal needs to be tame enough not to panic but not to be so tame that it wants to follow people instead of driving. The secret is actually training the pigs to move calmly when the person walks through the pens. The handler must never kick or slap the pigs. This would stress the pigs. Calm handling and walking through the pens will have no effect on weight gain. To prevent any possible detrimental effect, walking the pens should be done during the entire finishing period. There may be detrimental effects if a producer attempts to walk the pens for only one week prior to slaughter. When loading finishing pigs, move very small groups of 5 to 6 at a time. Do not store large groups of finishing pigs in an alley or holding pen. This will lead to damage caused by fighting. It is best to take each small group of pigs immediately from the finishing pen to the truck. New finishing buildings should have a 3-foot (1 m) wide alley. This is wide enough to allow 2 pigs to walk down it side by side. If a building has a 2-foot (.75 m) alley, only three pigs should be moved at a time. Do not overload the trucks. Overloaded trucks, especially during hot weather, is a major cause of high death losses. Do not allow pigs to stand in a fully loaded truck, get moving immediately. Heat builds up rapidly in a stationery vehicle. In winter, use straw for bedding. In extremely cold weather, straw provides the best insulation and helps prevent frostbite. Observations in packing plants indicate that trucks with inadequate bedding are more likely to contain frost bitten pigs. When there is high heat and humidity, it is best to transport pigs very early in the morning and at night. Stocking density should be reduced. Schedule trucks so that pigs can be unloaded promptly at the packing plant. Minimize the use of electric prods. Electric prods should not be used in the finishing barn. Calm pigs are easier to sort and separate then excited pigs. Pigs are easier to sort if the handler moves slowly and deliberately and separates the desired pigs from the group on the first attempt. Excited pigs stick together and are more difficult to separate. If pigs refuse to leave the finishing building, try shutting off the ventilation or reversing it. Pigs often balk if air is blowing in their faces as they exit the building. To make pigs flow more easily out the door of a finishing building, attach plywood to the last 16 feet (5 m) of pen near the door. This will prevent pigs which are being driven out of the building from seeing or touching pigs which are in pens near the door. After loading, the plywood should be removed because it will interfere with ventilation flow through the pens. Practical experience has shown that improving handling at the packing plant and reducing electric prod usage will improve meat quality. Approximately 10% more pork will be suitable for high quality exports to Japan when pigs are handled quietly and usage of electric prods is reduced. Below are some tips for improving handling in packing plants which will help maintain pork quality and reduce PSE. Rest pigs prior to moving to the stunning chute for 2 to 4 hours. Slaughtering pigs immediately after unloading will have a detrimental effect on pork quality. Use sprinklers during hot weather. Staging areas which lead to the stunning chute crowd pen should be filled only half full. Fill the crowd pen only half full and DO NOT push the crowd gate tight up against the pigs. They need room to turn. If pigs balk and refuse to go up the single file chute or constantly back out of the chutes, look for distractions that cause balking (Grandin 1996). Some of the things that cause balking are: air blowing in the faces of approaching pigs, shiny reflections on metal, puddles, a chain hanging in the chute, restrainer entrance too dark, seeing people up ahead and moving objects. Removing distractions and improving lighting will reduce balking. Light up the restrainer and chute entrances with lamps. Animals will not go into a dark place. The lamps must not shine directly into the faces of approaching pigs. Electric prods should be eliminated in the yards and staging area. Pigs moved with electric prods had higher heartrates than pigs moved with a panel (Brundige et al 1998). In the stunning chute an electric prod may be needed on an occasional stubborn pig. Some other tool should be in the person’s hand as the primary tool for moving the animals. The electric prod should only be picked up when it is needed. To reduce use it should not be constantly in the person’s hands. In a survey that the author conducted for the USDA, (Grandin 1998) it was possible to greatly reduce electric prod usage. In two plants which had excessive use of electric prods 44% of the pigs were electrically prodded. After handlers were instructed to fill the crowd pen only half full and tap the pigs first, the percentage of pigs which were electrically prodded dropped to 15%. Handlers were able to keep up with the line when electric prod usage was reduced. It is important to eliminate distractions which cause balking. At another plant, it was impossible to reduce electric prodding when the sun was out due to harsh shadows. When a cloud covered the sun the pigs moved easily. To solve this problem, the roof over the crowd pen had to be extended to block high contrasts of light and dark at the stunning chute entrance. In plants where pigs are stunned in groups on the flour electric prods should be totally eliminated. Monitoring of squealing levels is a simple way to monitor stress levels during handling. When pigs are quiet stress levels will be lower. Vocalization (squealing) is highly correlated with physiological stress levels and poor pork quality. (Warriss et al 1994, White et al 1995) In a slaughter plant an easy way to measure squealing is to count the number of stun cycles where the entire handling area is quiet. As each pig is stunned; score on a yes/no basis – “room quiet” or “heard a squeal”. From this you can calculate the percentage of time the room is quiet. Geneticists and producers must work together to produce pigs which are easy to handle. Genetically nervous pigs which have been raised in finishing pens where nobody has walked the pens may be extremely difficult to handle at the plant. Quiet handling at the slaughter plant will improve pork quality and reduce PSE. The last 15 minutes in the stunning is the most critical time. Geneticists need to select pigs which have a calm temperament and strong bone. One must be careful not to over select for a single trait. There can be strange interactions of traits. When the poultry industry solved their leg problems in large breasted birds, a new weird trait emerged. Heavily muscled roosters with strong legs and lower death losses are very aggressive and sometimes kill breeder hens. Abbott, T.A., Hunter, E.J., Guise, J.H., and Penny, R.H.C: The effect and experience of handling pigs willingness to move. Appl Ani Behav Sci 54:371-375,1997. Brundige, L., Okeas, T., Doumit, M., and Zanella, A.J: Loading techniques and their effect on behaviour and physiological responses of market pigs. J Anim Sci (Suppl.1); 76:99, 1998. Busse, C.S., and Shea-Moore, M.M: Behavioural and physiological responses to transportation stress. J Anim Sci (Suppl.1) (Abstract)77:147, 1999. Geverink, N.A., Kappers, A., Van de Burgwal, E., Lambooij, E., Blokhuis, J.H., and Wiegant, V.M:Effects of regular moving and handling on the behavioural and physiological responses of pigs to pre-slaughter treatment and consequences for meat quality. J Anim Sci 76:2080-2085, 1998. Grandin T: Objective scoring of animal handling and stunning practices in slaughter plants. J Amer Vet Med Assoc 212:36-93, 1998. Grandin T: Factors which impede animal movement in slaughter plants. J Amer Vet Med Assoc 209:757-759, 1996. Grandin T: Effect of rearing enviornment and environmental enrichment on behaviour and neural development of young pigs. Doctoral Dissertation, University of Illinois, Urbana-Champaign, Illinois, USA. 1989. Pedersen, B.K., Curtis, S.E., Kelley, K.W., and Gonyou, H.W: Well being of growing finishing pigs: Enviornmental enrichment and pen space allowance. In: Collins, E., and Boon, C. (eds) Livestock Enrichment IV. Amer Soc Agric Eng, St. Joseph, Michigan, USA, pp. 43-150, 1993. Monin, G. et al: Effects of Halothane genotype and slaughter weight on the texture of pork. J Anim Sci 77:408-415, 1998. Shea-Moore, M.,M: The effect of genotype on behaviour in segregates early weaned pigs tested in an open field. J Anim Sci 76:(Suppl.1) 100 (Abstract) 1998. Warris, P.D., Brown, S.N., and Adams, S.J.M: Relationship between subjective and objective assessment of stress at slaughter and meat quality in pigs. Meat Sci 38:329-340, 1994. White, R.G., DeShazer, J.A., Tressler, C.J., Borcher, G.M., Davet, S., Waninge, A., Parkhurst, A.M., Milanuk, M.J., and Clems, E.T: Vocalizations and physiological response of pigs during castration with and without anesthetic. J Anim Sci 73:381-386, 1995.